William Heerema is a family man with a good full-time job, doing golf course rehabilitation and maintenance for the county he lives in, in New Jersey. He works 40-50 hours per week in this role. Happily married, he and his wife Karyn have a 7-year-old son -- who is the main reason he also works on the side, selling beauty and health products. 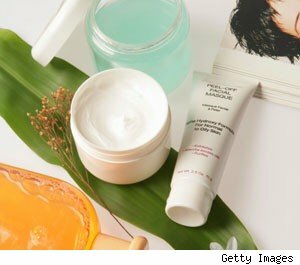 William is not your typical cosmetic or beauty product purveyor. He works outdoors in the dirt with his hands all day long, and does not frequent nail salons. But who says that only women are allowed to sell skin care products? Completely secure in his ability to successfully work an MLM business as part of his "plan B" to earn extra income, William is showing men and women everywhere that there are no specific gender rules when it comes to who can make extra money working for Arbonne International. Although happy and secure in his full-time position with the state, William recently looked into expanding his options so that he could offer his family a little more than what they were used to. After much research in 2010, he found he could do this with Arbonne International, the Swiss company that makes botanically based products such as creams, vitamins, bath products, and energy drinks. "I work 40-50 hours per week at my full-time job and 10 hours per week creating my fortune with Arbonne, so if you can devote just 10 hours per week or so to running your own MLM business, there's a plan B out there for whoever wants it," he says. For $109 you can sign up to be an Arbonne business builder consultant, which allows you to sell their products. At that time, you are also given a 35 percent discount on any products that you buy to use in your demonstrations. Additionally, you can also learn and earn through Arbonne's online university that offers motivational tidbits and business model suggestions. "Best of all, there is no limit to how much you can make," William adds. 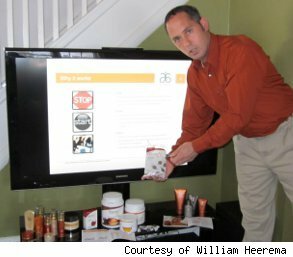 So for an initial investment of $1,000, William signed up to be a business builder consultant and purchased some products for his own home as well as three sample kits that William calls his "employees." These kits are lent out to potential customers for a few days at a time so they can try Arbonne's products before purchasing them. "It's what we like to call the 'try it and you will love it' approach," he says. While he made an aggressive investment of $1,000 to start up his Arbonne business, that is not required, and the basic rate of $109 covers a set-up package. For William, the choice to go with Arbonne was easy, even with all the criticism from his friends and family members about it being a scam and a woman's business. He notes that "health and wellness is all around you and it is recession proof" -- enough motivation for him. "I chose Arbonne [instead of Pampered Chef or Amway] because everything is consumable and I can leverage my time, which gives me a great recipe for success." Some people in this business do not stay committed, says William, meaning that they quit before receiving their first paycheck. "That reflects badly on the company and feeds many misconceptions about MLM companies being scams. People just need to reassure themselves." William knows that this is not a get-rich-quick scheme -- which is why he continues to keep his full-time job to support his family, while investing part-time hours each week to building his Arbonne business. "You have to build your relationships and your business if you want to have success, says William, who earns an extra $700-$1200 per month for the 10 hours he puts in each week. "It's such a small investment to grow a huge empire, you just can't quit." William also recommends doing your research. "You need to know the product that you are supporting," he notes, because your knowledge of the product will come through in customer interactions. Also, once you start with an MLM company, the best way to get established is to follow the leader and learn from those who had success before you. "Its not about making money to start off with, its about helping people and changing their lives for the better," he says. As for the future, William says that he is comfortable with just doing it on the side, so one day, he can double his full-time salary with his part time investment. William even admits that many of his most skeptical friends and family members are now "coming around" and becoming supportive of him and his unconventional side-gig because they see all the benefits. "Now people are talking about how positive I am and asking me about the business. They are coming around with positive energy now." From selling vacuums out of the back of his DeLorean in upstate New York in the 80's to selling educational software that is changing the lives of children everywhere, tune in next week for our upcoming feature about the ultimate Direct Sales pro. YoUr Turn! Have an interesting story to tell? Submit it to AOL Jobs.